2018 FIFA World Cup will soon kick off and the nation will come together with tentatively optimistic passion, hoping that this time will be England’s chance to relive 1966 football glory. 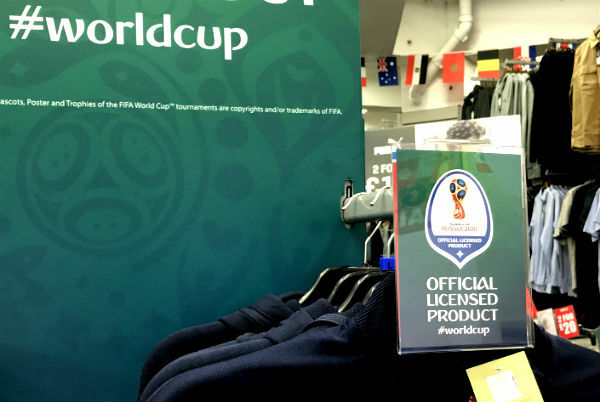 There is a huge opportunity here for retailers, but what can they do to maximise the impact of the World Cup and are they ready? Food and drink for home consumption – think crisps, pizzas, barbeque food, chilled beers - will increase as people host friends to watch the games, and the convenient timing of the games at around 7pm will help boost these sales further. Bring in the shoppers. You will find what you need. Sales of football shirts will inevitably rise. Adidas, the official sponsor of the World Cup sold a record 2 billion euros of football gear in 2014, but there is an increase in all sportswear and equipment as people become inspired to get off their sofas and do some exercise. TVs and related technology are likely to see an increase in sales during this World Cup period. Before the 2014 World Cup, the UK saw a rise of 40% in the sales of televisions with the nation suddenly keen to have the latest technology and a bigger screen to watch the games on. But it isn’t only these specific categories that can do well during the World Cup, there is an opportunity here for all retailers. The key is to be ready. The World Cup noticeably changes the mood of the nation. The nervous optimism at the outset is felt by us all, retailers need to create enticing displays and offers that capture this mood. But, if this optimism starts to falter, which let’s be realistic, it likely will, retailers need to respond. To do this shop floor staff need tools at their disposal which are quick and easy to implement. Utilising sign holders such as the Reflex allows displays to be changed very easily, meaning retailers can keep their displays relevant to shoppers with ease. Reassure shoppers. Only the genuine articles are here. Shoppers, especially of sportswear, want confidence that they are buying genuine merchandise. 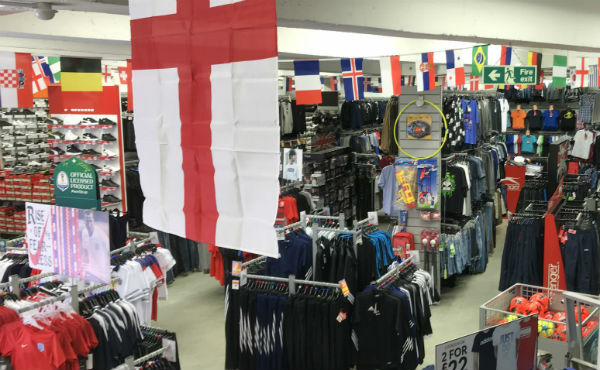 At Sports Direct they have understood this fact with clearly labelled stock leaving no doubt in shoppers’ minds about the authenticity of the goods they are buying. We mentioned Reflex before, you can see here how Sports Direct have used these sign holders to promote their products. As the World Cup rolls on and offers change, staff can quickly replace the graphics. 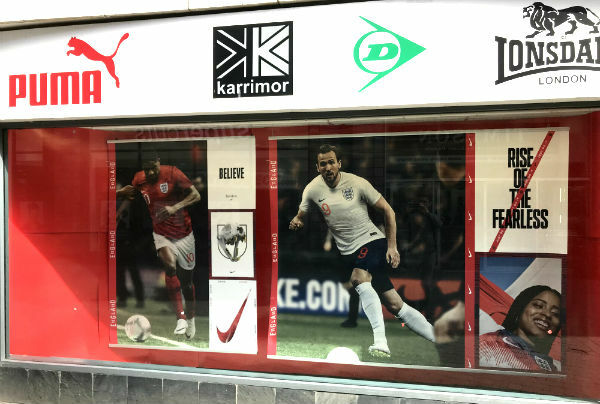 We hear so often about the demise of traditional retailers to online; the World Cup offers an opportunity for bricks and mortar retailers to capture the mood of the nation, to join in the conversation, to walk hand in hand with shoppers through the highs and the lows that the beautiful game brings. Can't miss the World Cup here! 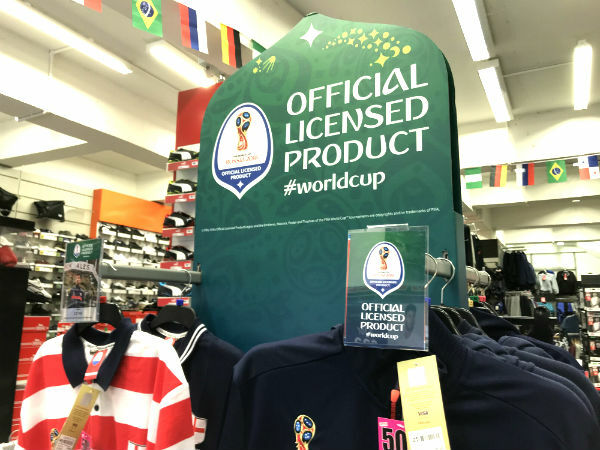 Being held only every four years and lasting just four weeks brings a special anticipation to the onset of the competition but also means that retailers need to be ready to seize the opportunity that the World Cup offers. Miss the opportunity this time and they may not make it to see the next round of games in 2022. Read more about how sign holders can be used to increase sales. 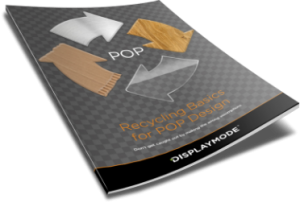 What is the best size for a retail sign holder?